Celebrate the water festival which marks the beginning of the traditional Thai New Year at Toshi Pan Asian Restaurant, Grand Millennium Dubai. A Thai-themed buffet of street food complete with live cooking stations will be serving favourite dishes and traditional desserts, while you get entertained by live music. from 6.30-11pm, Dh199 per person with soft beverages or Dh299 per person with three hours of free select house beverages, children from 4-10 dine for Dh69. Call 04-4234170. Mango Tree Thai Bistro at Hilton Dubai the Walk is celebrating the festival with culinary festivities featuring food dishes from the four regions of Thailand, starting at Dh39. From noon to 11pm. Call 04-3747555. Commemorate Songkran surrounded by the Burj Lake. Set menu of authentic family-style dishes at Thiptara, Palace Downtown, available until April 30, at Dh410 per person, from 6-11.30pm. Call 04-8883444. Pai Thai is recreating the festival fusing dining, decor and entertainment to create the experience, starting with a abra trip through the Madinat Jumeirah waterways to the venue. The experience includes a welcome beverage crafted from traditional Thai herbs, a sharing set menu of Thai classics and live entertainment accompanied by resident traditional dancer, until April 20. Dh295 per person for food only (minimum two people sharing). Call 04-4323232. If you’re a cheese lover, celebrate cheesy goodness, with McDonald’s UAE giving you the choice to ‘cheese up’ any item on the menu by adding nacho cheese sauce for Dh2, or for free between 1-2pm every Wednesdays. Seriously, anything on the menu. Available for a limited time, until May 6. 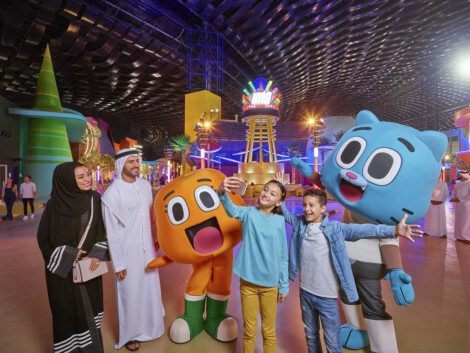 Filmbuffs are invited to Cinema on the Bay to lounge on bean bags and watch blockbusters for free, by the waters of Festival Bay at Dubai Festival City Mall. Today, Kung Fu Panda 3 will be screened. The outdoor cinema seats 150 people, and screens one movie every night, Sunday to Wednesday at 7pm, until April 30. Admission is free for all. Tomorrow Beauty & the Beast will be shown.